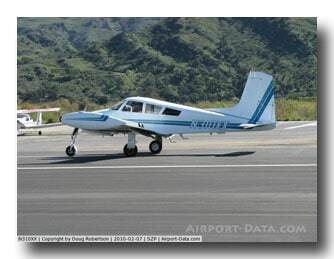 On the 3rd of October, a twin engine Cessna 310 took off from Airport-in-the-Sky (KAVX) on Catalina Island with two passengers. Within minutes, the pilot lost control of the aircraft and they “impacted terrain” (official term for crashed) about 600 feet southeast of the runway. I initially saw the photograph as Stern.de‘s Photograph of the Day and couldn’t believe that it was a non-fatal incident. The pilot and his passengers climbed out of the aircraft which went up in flames. It took the fire department almost an hour to gain control of the resulting 3-acre fire. 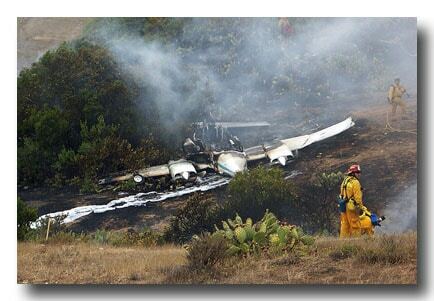 Looking at the wreckage of the plane, it is amazing that its occupants survived. Santa Catalina Island, commonly called Catalina, was originally owned by the William Wrigley, Jr., the chewing gum magnate, and his family. It is located 22 miles south by southwest of Los Angeles in the Pacific Ocean. 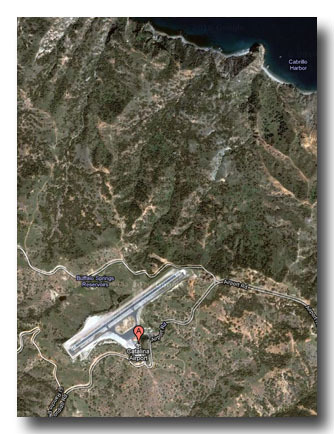 Catalina Airport is located six miles northwest of the Avalon central business district, at an elevation of 1,602 feet. The single runway, which dips midway, is 3,000 feet long and 60 feet wide. This journalist has flown into Catalina Airport as a passenger on similar twin engine aircraft. The airport lies at the island’s highest point, with roads leading to it climbing steeply, with many switchbacks. It was originally called Buffalo Springs Airport when it opened in the late 1930’s. United Airlines originally provided commercial service with DC-3 equipment. The pilot had dropped the passengers off at Catalina on the 2nd of October and flown to John Wayne Airport (KSNA) in Orange County. The following day, he returned to the airfield to pick them up. Over lunch, he noticed the weather. The pilot was not instrument rated and he was concerned that they would end up stuck on the island if the weather got worse. They agreed to leave immediately. 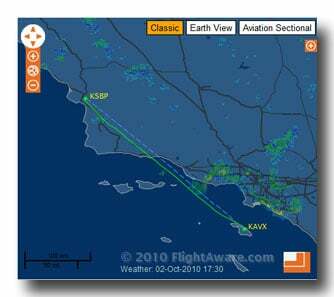 As the pilot had just flown in from KSNA and they were in a hurry, he conducted an “abbreviated” engine run-up as they taxied to runway 22. The engine trouble might have been highlighted on the ground if he’d done full power checks; however it is fairly common practice to shortcut these if you’ve already flown the plane that day. The pilot had 700 hours, 650 on type, so it seems likely that he would have noticed if one of the engines was running rough. The takeoff roll was normal, but about 2 to 3 seconds after liftoff, the airplane veered “sharply to the left,” which the pilot interpreted as a failure of the left engine. The pilot was concerned about airspeed decay due to the flaps and landing gear being deployed, so he pushed the nose down to maintain airspeed. The pilot then noticed the “right wing coming up,” so he retarded the right throttle. The airplane then entered a fog bank, and impacted terrain on a magnetic track of approximately 146 degrees, about 600 feet southeast of the runway. It came to a stop within 200 feet, with the cabin intact. The airplane was subsequently engulfed by fire. All three occupants exited the airplane without external assistance. The pilot and one of the passengers sustained minor injuries, the other passenger was taken to hospital with serious but non-fatal burns. Still, they managed to walk away from one of the most frightening incidents that can happen in an aircraft: engine failure directly after take-off.